Roger is a retired member of the New Jersey State Police. A graduate of the New Jersey State Police Academy during 1982, he has 27 years of experience in law enforcement. He commenced his career as a general road duty trooper. He's been a squad supervisor, station administration officer, an assistant station commander and the Assistant Traffic Officer at Troop "B" Headquarters. Roger was born in 1954 in Benevolence, Georgia. He's the youngest of three children born to Willie C. and Doris Johnson. At 9 months of age, his parents relocated their family to Newark, New Jersey. He received his formative education via the Newark City School System. He was enrolled in the Newark School System from September 1960 through June 1972. He graduated from Weequahic High School in 1972 after attending his freshmen through senior years. During September 1972, he began his undergraduate career at Newark College of Engineering (now New Jersey Institute of Technology). In 1973, he transferred to Rutgers University-NCAS, where he majored in economics/accounting. During May 1977, he received his bachelor's degree. While employed by the state police, he also attended Seton Hall University, in South Orange, New Jersey, where in May 1987, he received his master's degree in general professional education. 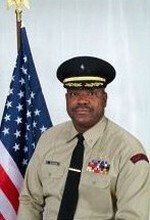 Roger has served as financial officer for The African American Law Enforcement Association and The Cadet Corps. He has volunteered for community service initiatives and has worked closely with various community leaders, educators, and school districts in an attempt to alleviate recurring juvenile delinquency. Other areas of interests include computers, sports, and travel. Roger is married to Dawn A. Johnson and they are the parents of three wonderful children.